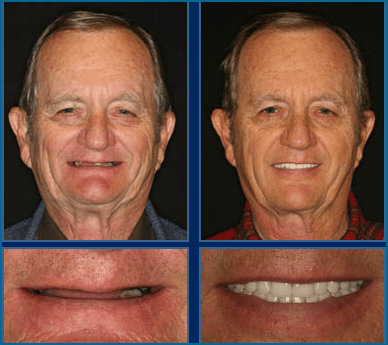 From 1 tooth to an entire smile restoration – we may have better solutions. Know your options with a no-pressure Complimentary Consultation. 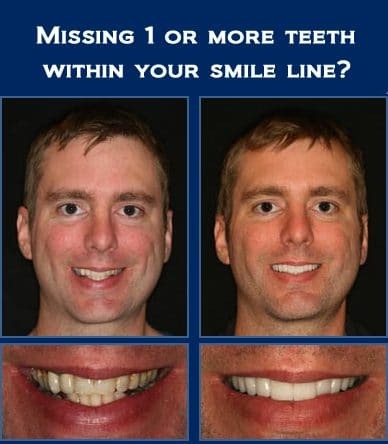 MISSING 1 OR MORE TEETH WITHIN YOUR SMILE LINE? When missing one or more teeth in the smile line, the use of a dental implant may NOT be the best choice. A Dental Bridge offers many advantages. Matching the color of an implant crown (replacement tooth) to the surrounding natural teeth is very difficult. Over time your natural teeth will darken but the implant crown will not. This will cause the crown to stand out. Dental Implants in these areas normally require 6 months to stabilize before they can support a replacement tooth. Dental Bridge uses the surrounding teeth as anchors to hold new replacement teeth that “bridge” the gap. A Dental Bridge is incorporated as part of a Smile Makeover and can be completed in as few as 2 visits! The Dental Bridge is made at the same time as your new porcelain veneers and/or crowns. So they match perfectly in both color and shape. Your new smile will never stain even if you drink red wine, colas, or even use tobacco. Your new smile is extremely durable and will be backed by our amazing Last Time You Pay policy. BEEN TOLD YOU MUST LOSE ALL YOUR NATURAL TEETH? Frank was told by another dentist that all of his remaining natural teeth would have to be removed. 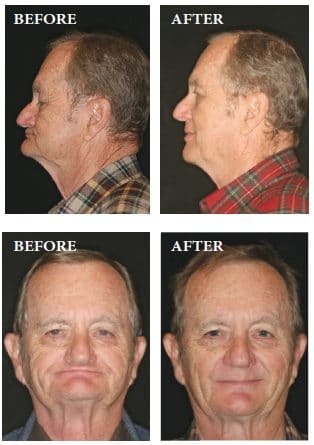 But, we were able to save most of his natural teeth and create a stunning new smile that also restored the contour of Frank’s face. As you can see by the photos a new smile can turn the clock back 20 years and is almost like an instant facelift.